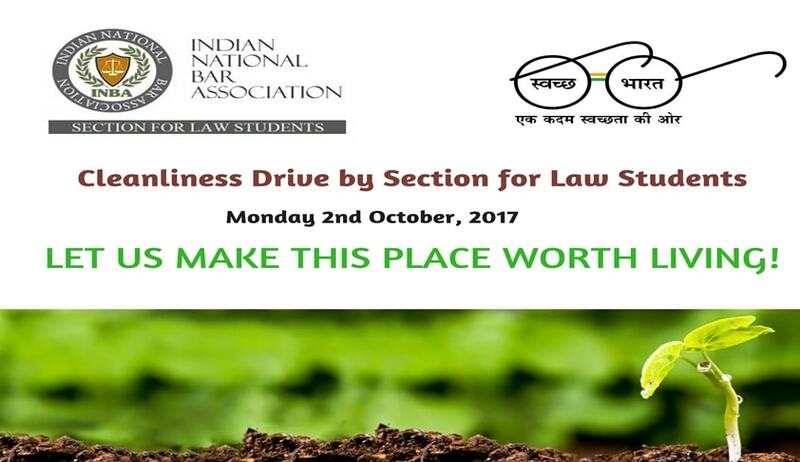 Section for Law Students, INBA works as a voice of law students and organizes various activities which further professional opportunities among law students. It offers students a distinctive membership experience which bridges the gap between disparate legal jurisdictions. As a part of Swachh Bharat Mission government organizes the “Swachh Bharat Week” from 25th September – 2nd October. The initiative is to celebrate anniversary of Swachh Bharat Mission on 2nd October and to spread the message of cleanliness around every corner of the country. INBA invites volunteers for being a part of the drive and contributing to government mission in making the nature clean again. A small step makes big differences. Palak Arora, Email: palakapra02@gmail.com or Phone: +91-9582830192. Note: All participants will receive a Certificate of Participation in recognition of their efforts to participate in the campaign. INBA is looking for the volunteers to make a contribution to slum children to give away clothes, stationary, books or any other thing through which you can help these children in any way. All these children need is support and a little gesture can put up a smile on their faces. Let us just spread happiness. On the prestigious day of Gandhi Jayanti let us contribute for a worthy cause.